I offer a short introduction to a superb long piece written by performance poet, John Gartland. For those taking the journey to the end, a reward awaits. For those who don’t you were not the intended audience. And that is okay. 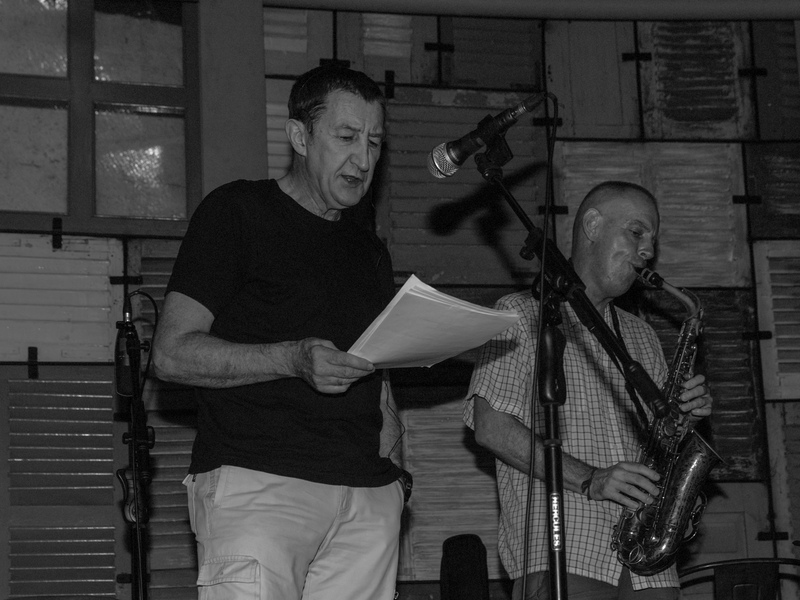 The focus of the writing is poetry and two performances John Gartland gave in Phnom Penh, Cambodia on May 31st and June 1st of 2014. On the latter date Christopher Minko and saxophonist Jimmy B were musical accompaniment at the renowned Meta House. absorbed some well‑turned definitions of the art. enough poetic rope to hang out any sensibility to dry. sniffed, will make you high. 2014. Two poetry readings in Phnom Penh, the first, on May 31st. as the guest of Chris Minko, and his band Krom, at Doors Club, the second, on June 1st. at Meta House Arts Centre, with Chris on guitar, and his sax sideman, Jimmy Baeck in support. Recently arrived from Bangkok, I’d been to Cambodia, before, briefly, but this was my first time in Phnom Penh. A poetry reading is always a leap in the dark, but reading in a strange city, in a new country, where nobody’s heard you, or knows what kind of thing you do… that is like free-falling, it’s solo stuff, risky and exciting. of a parachute you’d described). coquettish come‑on to the sky. And who, the hell, you may ask, listens (voluntarily) to poetry readings, anyway? Poetry? What has that got to do with anything, these days? Most people haven’t a clue what it’s for. Inscriptions on tombstones? Anthologies that induce paralysis quicker than a snakebite? So, as a visiting poet, you’re generally seen as about as relevant as a vacuum cleaner salesman in the desert. You’d better offer something of interest, pretty quickly, or they’ll be taking selfies and grooming their social network on a smartphone before you can say, “Alfred Lord Tennyson”. Challenging? I’ll say. Even hack writers dismiss poetry. They don’t generally understand it, or see any use for it. For god’s sake, what’s the point? It doesn’t even pay! Isn’t it obsolete? Writing, and then performing your poetry, is equivalent to riding the Wall of Death in public. You’re glued to the moment by vertigo and risk, with an audience (if anyone bothered to show up) just wondering how long it will be before you fall off, and become another stain on the upholstery. huge with silence, older than God. I’ve tried sealing off the entire sector. hot for another quarter million years. When they give me my exit ticket, no need to say I was a worker in chemical factories, warehouses, steel mills, or was a student of Shakespeare, and Elizabethan drama, a driver, sales director, professor, father, swimmer, traveler, radical …. Just say, “Poet”. It’s a life which is critique and concert, never still, never bored; irreligious and holy, outrageous and awed. A spring night in Cheongju. in the elixir of cold oranges. A thousand obscure roads, a portfolio of oceans, crossed beneath skeptical stars, a jostle of passport stamps and a trove of encounters; love, and loss, history given an individual voice. The phantom of ambiguity is the keynote of poetry …. jazz keyboard; fought with Castro and his forces in the old days. but listened to the tale he had to tell. 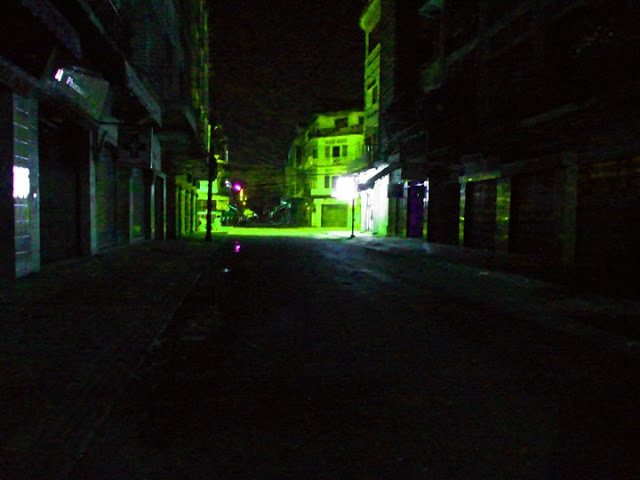 So, to Cambodia, many tales, and treks later; processing a new city, arriving through shabby, crumbling outskirts, still haunted with nightmare. The newsreel is running, projected on the trappings of modernity, on the cafes, the sudden, lockdown traffic jams, the insect swarms of motorcycles. Fear still occasionally crackles like background radiation; for, just decades ago, a black hole of communist terror sucked in civilization here. Often during my trip, there will be flashbacks of the torture and ideological madness imposed on these people by Paris-educated marxists; ideologues whose social engineering killed twenty-five percent of Cambodia’s population, and who made murderers and torturers out of children. 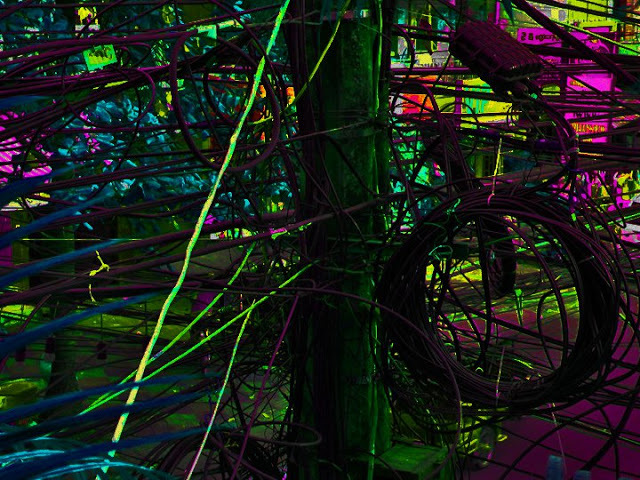 Their psychological clones, armchair commissars, infect the internet, with the same po-faced certainties. Mountains of victims’ skulls in Pol Pot’s blood-spattered torture centres are not allowed to sway glib Marxist certainties. When their political correctness is questioned, wait for reflexive smears straight out of Mao’s little red catechism. Mao was better at mass murder than Pol Pot; he killed some thirty million in the “Cultural Revolution”. When I was working in South Korea, I also met, and talked with refugees from the North Korean communist madhouse, with its death camps, starvation and terror. Sound like a familiar marxist recipe? They understand the communist’s “inevitability of history” there, all right. It long ago morphed into the inevitability of tyranny. The blood-stained newsreel is still running, and running…. Yes, Phnom Penh is a haunted house, a puzzle palace full of tormented shadows; but the survivors have their face forward. The night is Noir. The streets are busy, and the music is played loud in the big, crowded night- space and girlie bars of the Beer Garden, Phnom Penh’s sexual equivalent of a food court. At the height of the proceedings, the beat seems loud enough to drown the collective memory; loud enough for an exorcism; and the beat goes on..
and her girls at Anna Jet. The customers pay tribute with their eyes. sublime apotheosis of the dance. into the past in Anna Jet. Chris Minko is a laid back Australian expat, a musical perfectionist, who, in Phnom Penh, has put together his unique band, Krom. Chris’s ornate guitar style, originally inspired by John Fahey’s work, interweaves with the eloquent sax of Jimmy Baeck, and the exquisite Khmer vocals of Sophea Chamroeun and Sopheak Chamroeun. There’s something haunting and addictive about Krom’s music. It’s poignant, often, almost impossibly beautiful, but the material the band covers in songs, both English and Khmer, is dark and jagged. It’s a yearning and wounded blues that tells of the exploited and the abandoned. 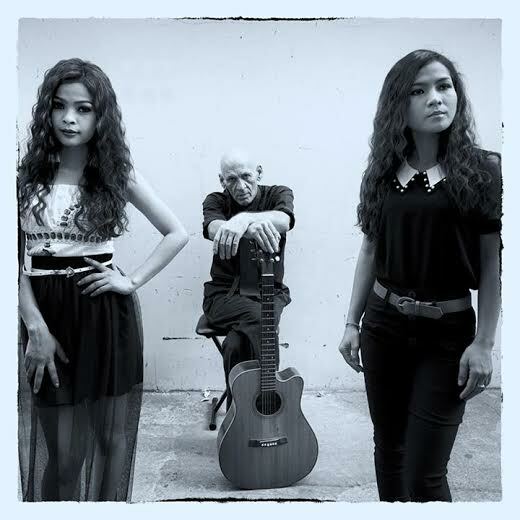 It is a multi-layered “noir” music, growing directly out of the Khmer landscape. And it’s fed by both its idyllic beauty and its hellish years under totalitarianism. Chris, who, in another incarnation, does invaluable work rehabilitating victims of Cambodian land mines, calls it, “Mekong Delta Blues”. It’s a unique sound from a unique band; music that speaks for our time, music that grabs you by the heart, and doesn’t let you go. the dirge of a steel string. Here I am again, I’ve just once more done the artistic equivalent of jumping through the aircraft door, and stepped forward to the microphone to read, on a new planet, but with the familiar excitement. It’s the Doors club, Phnom Penh, and I’m reading some of my poetry before the Krom gig, on the last night of May. Alongside are Chris and Jimmy, injecting their musical expertise, to add to the impact of the poetry (poetry and music is a formidable cocktail) “Why, poetry?” You know someone is asking; no time for questions now. It’s time to DO poetry. I wave, and he is gone. June 1st, The Meta House reading; blessed with an excellent audience. A fine, spacious upstairs room with good acoustics and an adjacent bar. Poetic free-fall…. You’ve got the audience hooked, your newsreel is running. You, for “your masterpiece of minutes”, are part of that select band, that Shelley called, ” the unacknowledged legislators of the world”. You’re the voice of poetry. You’re not on anybody’s payroll; nobody owns your words. Your skills don’t go whoring with P.R. cut throats or advertising copy writers. You serve the art, and what Leavis, the English critic, once called, “The Great Tradition”. You stand “… on the shoulders of giants” (to borrow Newton’s words) and there’s no need to explain, here at least, to sleepwalkers and pygmies, that there’s something more to life than football and shopping. would break a landscape painter’s heart. for several moments have it stark and clear. you race the thrilling onset of the dark. That is our life; a constant race against , “the onset of the dark”; the darkness of dusk, or the advancing darkness of our own mortality. Equally, it’s a race against the darkness of fanaticism, that pitchy, scream-haunted nightfall of tyranny. Here in Phnom Penh, the untold stories of lives destroyed by communist zealots, and the sense of all humanity degraded by their brutality, ripple like feedback behind the House music, the partying and the pole dancing hookers. When it comes down to it, and life throws the big issues at us, when we try to come to some terms with that madness, don’t look to the self-interested falsehoods of PR men or advertising hacks. You’ll need the utterances of poetry. You’ll need ..………. and fumble in his misery for rhyme. to celebrate its stature, and to wonder at itself. but poets live the fuller, by their nature, beating time. the company of poets I’ll make mine. be the Process speaking, for a time. and they can image water into wine. Those black flags of mourning, who better to fly them? how better to tell them? Where better to start? Where else but the company of poets? our passage and our going. the indelible company of poets. 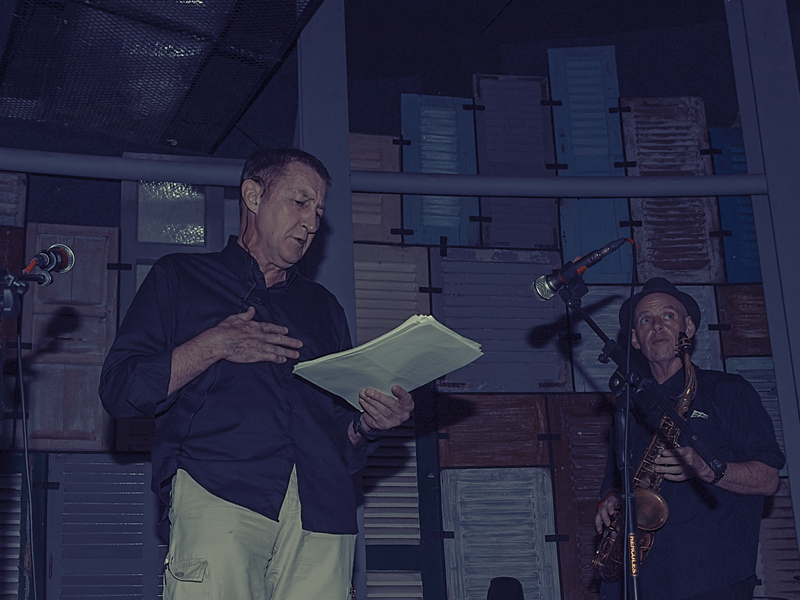 John Gartland is returning to Phnom Penh in November, 2014 to work again with Chris Minko, and to read at Meta House and elsewhere. 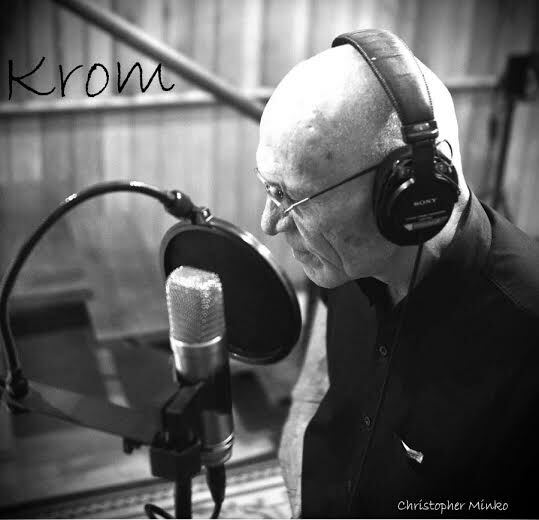 Krom’s forthcoming new album, “Mekong Delta Blues” will feature a track, with the lyric by John Gartland and music by Chris Minko. Find more of his poetry at the Facebook page, Poetry Universe, and the website below. 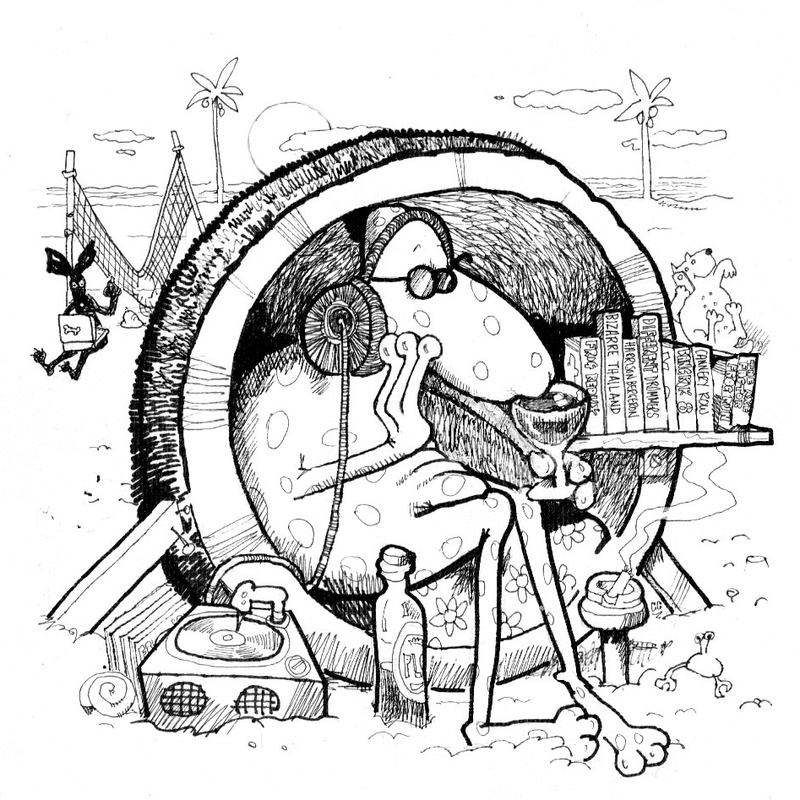 Some of his published works, now out of print, such as “Gravity’s Fool” (2009: Fourth edition) can be downloaded from his website, where tracks from his audio album, “Hologram Heart” (2014) can also be heard, with him reading some of his poems, accompanied by top Bangkok musicians and producers, Keith Nolan and Chris Healy. Take me to your reader…. This post may also be viewed at Chiang Mai City News by clicking the above banner.